Each golf style drinking game set includes 6 glass shot glasses, 2 mini golf putters, 2 metal balls, flag and a real sand pit! Gift boxed in full color retail packaging. Our drinking game sets have been independently tested for safety! Complete set measures 9-3/4" x 12-5/8" x 1-7/8". 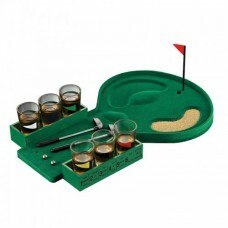 Miniature golf clubs measure 1-1/2" x 5-1/4" x 1/2"
On-course coin game makes every shot count through the last hole. Great fun for both low and high ha..
Enlarge your tee game by using Pride Sports Evolution XL Golf tees. These performance golf tees are ..